Saskatchewan One Room School Project provides an online history for current generations to enjoy, preserve, and experience, our historical educational, architectural, and cultural, heritage. 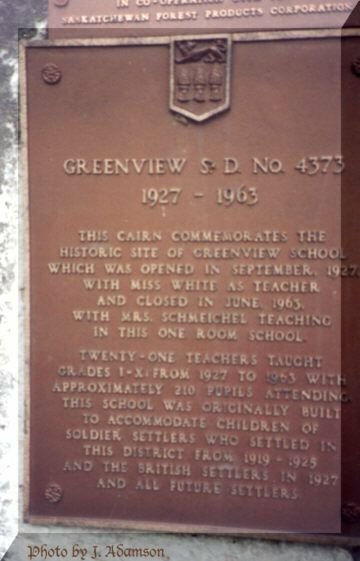 This cairn commemorates the historic site of Greenview School which was opened in September 1927 with Miss White as teacher and closed in June 1963. With Mrs. Schmeichel teaching in this one room school. Twenty-one teachers taught grades 1-XI from 1927-1963 with approximately 210 pupils attending. This school was originally built to accommodate children of soldier settlers who settled in this district from 1919-1925 an the British settlers in 1927 and all future settlers. Copy any URL (CasE SensiTiVE) from Ancestry/Rootsweb Saskatchewan One Room Schoolhouse Project from the top of the browser page and paste it into the Wayback Machine search box. Due to maintenance issues experience by Ancestry.com/Rootsweb, we are very sorry for any inconvenience caused.